We have gained immense technological expertise of manufacturing and supplying Bogie Hearth Furnace. It allows multiple functions including hardening, annealing, stress relieving, firing of ceramic components, and tampering of forged components. It can be availed in multiple choice of heating by using gas, electricity, or oil. We are offering comprehensive range of Bogie Hearth Furnace. Offer most energy efficient twin hearth moving furnace design for optimum space usage and increased productivity. Can offer with purlse firing technique in oil/gas fired furnaces. Bogies with a width of 7 to 8 mtrs can be offered with centralised loading on the bogie. 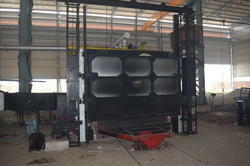 Bogie Hearth Furnaces suitable for the heat treatment of large loads. The Bogie Hearth furnaces are designed to operate up to 1200°C with heating by natural or LP gas, oil combustion systems and electricity. 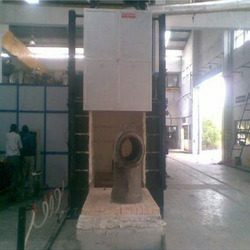 We are a well known name in manufacturing, supplying and exporting Bogie Hearth Type. For Annealing Normalizing, Stress Relieving, Hardening, Tempering Of Bulky Parts, Welded Components, Castings, Forgings. We provide heat treatment solution for Bogie Hearth Electric Furnace . This furnace is used for annealing and hardening of large parts, like heavy cast parts or tool steel dies to temperatures between 800 °C and 1200 °C. In this we provide fabrication of inside wall of furnace so as to withstand such a high temperature of around 1200 °C. For various industrial heat treatment operations like preheating , hardening, annealing, normalising, stress relieving etc. We manufacturer of Bogie Hearth Furnace, which used for Annealing, Normalizing, Hardening, Stress Relieving, Solution Annealing, Tempering, etc.